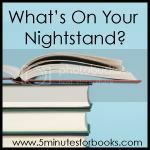 The last time I participated in the What's on Your Nightstand meme - hosted by 5 Minutes for Books - was back in February. That was an accident! I completely forgot the last two months, until I felt like it was too late to jump in. But this time I have planned ahead - and just in time! Since we're approaching the onset of summer, and thus the conclusion of Katrina's Spring Reading Thing, I need to get in gear and focus on my Spring Reading Thing goals! I love participating in Nightstand because it re-orients me and gets me moving in the right reading direction. 1. Emma . I am currently half-way through the story, so I'm doing good there. 2. 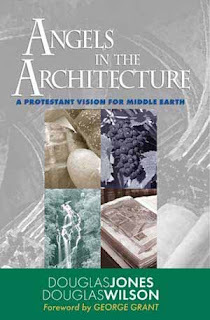 Angels in the Architecture : A Protestant Vision for Middle Earth, by Doug Wilson and Doug Jones. 3. 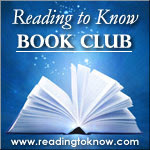 The Adventures of Tom Sawyer , by Mark Twain which I'm reading for the Reading to Know Book Club. I started that one today and I need to finish it quickly as this Friday I'll be posting our wrap-up post! 4. The Second World War, Volume 2: Their Finest Hour , by Winston Churchill. This one now seems more daunting to me, seeing that I do not even have one solid month left to read it. However, a deadline is always a helpful thing and since I really DO want to read it - (and because I'm already well on the road to finishing up the others from my list) - I might plug through and get it done. So, that's where I'm at reading-wise. Here is to a busy and full reading month! Now . . . ! I'm off to see what's on YOUR nightstand! Love Emma! It's a close second to Pride & Prejudice. I hadn't participated in a long time either...probably closer to a year. Looks like you have a lot of reading ahead of you this month! I, too, enjoyed Emma a lot. :O) Happy reading! I've never read Emma or Tom Sawyer... oh, but I know they're great classics! I'm currently reading a good classic favorite, Little Women for the Louisa May Alcott challenge. 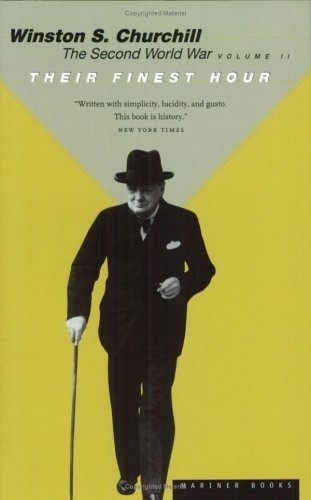 The book you're reading that is written by Winston Churchill looks interesting to me.... might have to put that on my take-a-look-at list. It's always fun to look around and see what everyone else is reading! As always -- interesting list. I have heard a lot of wonderful things about Girl from Limberlost. Oh Emma! I love that book. My littlest sister is reading that right now actually. Are you liking Mark Twain any better these days? I keep thinking about that quote you posted about Classics. As much as I REALLY want to read them, I find it very difficult to make time for them. There's so many newer books that seem to grab for my attention. Despite that, I'm still hoping to finally get to one of Austen's books. Giving up Gimmicks looks really interesting. I'll be looking forward to hearing your thoughts on it. I read the first book, but have yet to read the rest and when I saw that there was a new book out, I was so excited and knew I wanted to make reading the whole series a priority! Looking forward to it! I had forgotten about this completely until I saw you had mentioned it on Facebook. So I'm late, but here! I enjoyed Emma a lot. Thanks for the reminder about Girl of the Limberlost. I definitely want to reread that one. How did I miss Nightstand?!?! Angels in the Architecture looks fasciNATing. I'll look forward to hearing what you have to say about it. And eek! it really is that close to the end of the month? I'd better get Tom Sawyer finished up (or at least make decent enough progress that I can write something worthwhile about what I've read so far. Ahh, yes, the Spring Reading Thing. I need to go back and see how I'm doing with that and hopefully not freak out about how sidetracked I have probably gotten! A Girl of the Limberlost is on my lost, not sure I have time to join in, but maybe! I have that Churchill series on my TBR list, need to make time for that soon as I'm fascinated by WWII. Glad to see you back in the Nightstand circle! I think Emma is one of my favorite Austen books. I may have to join up for your June Book Club. I read Freckles a couple of years ago and really enjoyed it. I can't wait to read the reviews of some of these books! I'm trying to decide if I'm excited or overwhelmed by my June list, chuckle. Pride and Prejudice is the only Austin book/movie that I love. The others just don't satisfy me the same way. As for my reading in June - I need to settle curriculum choices for 2012-13 and write some unit studies for us. So my reading will be geared toward my kids - as usual.